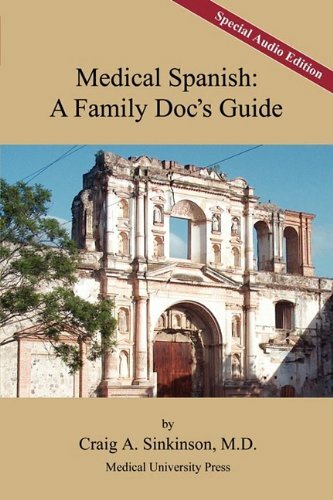 Medical Spanish: A Family Doc's Guide, Special Audio Edition is the most extensive Medical Spanish resource ever created for family medicine. At 688 pages, it is so complete, those who practice family medicine will never want to work without it again. History: Step-by-step phrases for taking a complete history. Don't know much Spanish? No problem. If you speak English, this book will allow you to obtain all the information you need from Spanish-speaking patients. It is that complete and easy to use. Physical Exam / Evaluation: Just as easy are the step-by-step phrases for performing a complete physical examination and evaluation. No matter what your Spanish level, this book orients the exam and evaluation to the way you think in English. Diagnosis: A virtual cookbook for instructing patients about numerous diagnostic issues. Want the information in technical terms? Want the information in lay terms? And want the information explained in the kind of Spanish, which your patients understand? Procedures: Need to explain the details of procedures to your patients? Just pick your topic. Treatment Explanations: A whole host of treatment issues and their explanations - from sinusitis and birth control to the common cold, hypertension, and many more. Vocabulary: From soups to nuts - literally - all of the vocabulary needed for family medicine is in this book. Audio: Over 2 hours of clear and crisp Spanish pronunciation, including essential phrases and vocabulary. Uncommonly simple - and utilitarian. This book has it all. If you have any questions about this product by CA Sinkinson & Sons, LLC, contact us by completing and submitting the form below. If you are looking for a specif part number, please include it with your message.